VUCA—it’s an acronym that’s gained a lot of traction in recent years. Standing for Volatile, Uncertain, Complex, and Ambiguous, VUCA was coined in the 1990s to describe the global situation after the end of the Cold War. It’s since seen a renewal as geopolitical upheavals have become more and more frequent—for many, it accurately describes the primary challenge to conducting international business today. 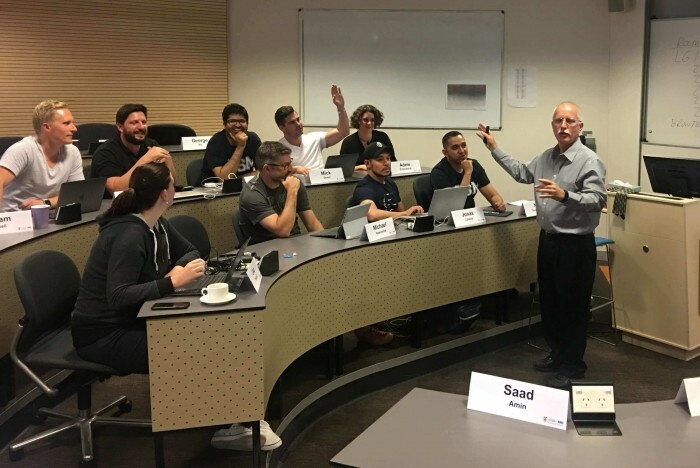 For experienced business leaders wanting to know how to steer their careers through these choppy waters, the MBA (Executive), or MBAE, at the Australian Graduate School of Management (AGSM) at the University of New South Wales Business School is offering to help. According to George Shinkle, an associate professor at AGSM, the MBAE program is designed with VUCA-aware students in mind. “A lot of what we focus on across the entire program is the idea of mental models or mindsets,” he says. According to Impact International, good leadership in VUCA environments means employing a number of adaptable skills, from prioritizing networks over company hierarchies to promote collaboration, to leveraging diversity so as to have multiple viewpoints looking at the same problem. Though both the core and elective modules in Stage One of the course help to prepare students for this environment, it is in the final year of the course that this instruction kicks into high gear, as the students enter Stage Two: The Executive Agenda Year, or EAY. Comprising of four courses, the EAY aims to strengthen and test students’ capacity for strategic management and leadership in the first course, as well as more creative thinking around innovation and entrepreneurship in the second course. “We see a lot of organizations requesting that we do [this, because] organizations need to be more innovative than they have been in the past, so there’s a lot of pressure to figure out how to do more innovation and do it faster,” says George. The result is an MBAE that is geared towards creating adaptable business leaders, something that George says is more important now than it has been in the past. “20 years ago, you [only] had to make changes because something had happened—in today’s fast-paced world, organizations are going through multiple changes very quickly, so the idea of continuous transformation is what people are talking about,” he explains. One of the key ways that the EAY prepares students at AGSM for these changes is by teaching them the principles of design thinking. Design thinking is a means of approaching tasks using a solutions-based method, rather than a problem-solving one. Unlike analytical thinking, design thinking is about building on ideas through techniques like brainstorming sessions, bringing in a variety of perspectives to approach a conundrum. All this teaching comes together in the residential components of the course, when MBAE students convene for a four-day immersion period during each 10-week course. Students learn to tackle group projects, with activities ranging from boat-based team-building activities at the North Shore Rowing Club in Sydney, to live cases, when a practicing manager visits the class and poses a business problem that needs solving. “All the residential sessions work on how to apply these concepts that are taught outside of the residential, and in that process you have an opportunity to learn from the other managers in the class with you,” George says. These connections have huge benefits even beyond the course, both professionally and personally. George says that many students keep in touch long after graduation. MBAE students also have access to the AGSM alumni network of over 17,000 students. Many students use the MBAE course to switch careers—George has known people to make the jump from corporations into non-profits or entrepreneurial endeavors, and a few who used what they learned at AGSM to leverage large (multi-step) promotions within their own companies. This is largely down to the teaching philosophy during the EAY: that the leaders who will thrive in a VUCA world are the ones who have benefited from this combined training in leadership, change management, long-term strategy, and teamwork. “We focus on critical thinking and dealing with the paradoxes that organizations face with confidence and humility,” says George.